Bruce Anderson has paid tribute to former Aberdeen striker Adam Rooney and Elgin City for helping him secure a new three-year Dons contract. 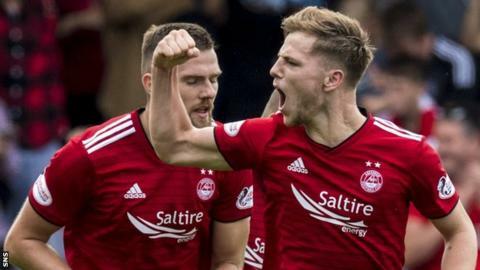 The 19-year-old scored a late equaliser as he made his Aberdeen debut off the bench against Rangers in August. "I benefitted greatly from my spell on loan last season," he told the Dons website. "My eyes were opened at Elgin. "Adam Rooney has been the biggest influence on my career. He was like a father-figure to me." Rooney's departure to Salford City this summer led to Anderson being called up to first-team duty after his six goals in 14 appearances for League Two outfit Elgin last season - and a prolific strike rate for the Dons' under-20s. "I only had a year left on my contract, so that was in the back of my mind, but all that's sorted now, so I can get my head down and really focus on my football and hopefully keep scoring goals," he said. "I was always confident that, if I got a chance, I'd take it, so I can't complain with how the start of the season has went. Now it's just down to me to push on." Boyhood Dons fan Anderson, who has now made four substitute appearances, revealed that he had also played in central midfield and as a support striker in his youth. However, he feels he has blossomed as an out-and-out striker like mentor Rooney. "He was always giving me advice and, even now that he's left, I'm still on the phone to him after most games and still checking up on him," Anderson added.